Citation: Radha Devi.G.,Babu,M.C.,(2015).Online Review Mining for Forecasting Sales. 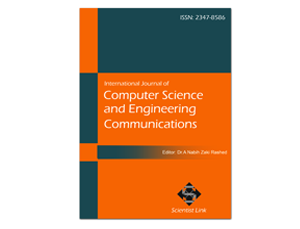 International Journal of Computer Science and Engineering Communications,Vol.3,Issue.4,pp.1220-1223. The growing popularity of online product review forums invites people to express opinions and sentiments toward the products .It gives the knowledge about the product as well as sentiment of people towards the product. These online reviews are very important for forecasting the sales performance of product. In this paper, the online review mining techniques discussed commercial product. Sentiment PLSA which is responsible for finding hidden sentiment factors in the reviews and ARSA model used to predict sales, performance. An Autoregressive Sentiment and Quality Aware model (ARSQA) also in consideration for to build the quality for predicting sales performance. This paper proposes clustering and classification based algorithm for sentiment analysis. In this paper, automatic data mining technique for predicting sales performance on a product quality domain .I tackle the problem of mining reviews for predicting product sales performance. The product feedback was got from the manufacturer, admin and the user who used the products and the admin automatically re-ranks the quality of the product using the feedbacks given. This makes the product user�s to determine the real quality of the product and they will be satisfied. The manufacturer initially gives their feedback to the main admin, and then the main admin will Re-rank according to the quality which displayed to the new user�s. Then the new user�s feedback is also obtained in the text format so that the admin will again Re-rank the product from the users point. To upload the product in the Admin, the manufacturers have to create an account with the admin. To create an account the manufacturers have to provide their username, password and product id, rate of the product, expiration data etc� This information is stored in the database of the admin. Once the manufacturer creates an account they are able to upload their product in the admin. Once the Manufacturer uploads the product in the admin, the product will be displayed in the admin. Also all the manufacturers and their products information will be stored in the admin. Also the admin will store all the records of the manufacturers they are accessing the admin. Once the manufacturer uploads the products information in the admin, they will give the feedback about their product. Mostly these are not trustable. So the admin will check the quality of the product and leave the feedback regarding the product. This feedback will be trustable because the feedback is given by the admin and not by the manufacturers. So that the ranking is applied and the product will be listed as per the admin�s feedback. Once the user bought the product and leaves the feedback regarding the product. Once the server got the feedback from the user, the server will re-rank the product based on their feedback. After it was re-ranked, the server will update the product quality as per feedback. If the user search of the product deals generally, the admin will display the deals of the day for the particular product from the different manufacturers. So that the user can see the deals and purchase the products by using the deals. Bing Liu, Junhui Wang, Natalie Glance andNitin Jindal. Detecting Group Review Spam . WWW 2011, March 28� April 1, 2011, Hyderabad, India. Lim, E.P., Nguyen, V.A., Jindal, N., Liu, B., and Lauw,H. Detecting product review spammers using rating behavior. CIKM, 2010. N. Jindal, B. Liu, and E.-P. Lim. Finding unusual reviewpatterns using unexpected rules. CIKM,2010. Siddu P. Algur, AmitP.Patil, P.S Hiremath and S. Shivashankar.Conceptual level Similarity Measure based Review Spam Detection. IEEE 2010. D. Gruhl, R. Guha, R. Kumar, J. Novak, and A.Tomkins, �The Predictive Power of Online Chatter,� Proc. 11th ACM SIGKDD Int�l Conf. Knowledge Discovery in Data Mining (KDD), pp. 78-87, 2005. A. Ghose and P.G. Ipeirotis, �Designing Novel Review Ranking Systems: Predicting the Usefulness and Impact of Reviews,� Proc. Ninth Int�l Conf. Electronic Commerce (ICEC), pp. 303-310, 2007. Y. Liu, X. Huang, A. An, and X. Yu, �ARSA: A Sentiment-Aware Model for Predicting Sales Performance Using Blogs,� Proc. 30th Ann. Int�l ACM SIGIR Conf. Research and Development in Information Retrieval (SIGIR), pp. 607-614, 2007. L. Cao, C. Zhang, Q. Yang, D. Bell, M. Vlachos, B.Taneri, E. Keogh, P.S. Yu, N. Zhong, M.Z. Ashrafi, D. Taniar, E. Dubossarsky, and W. Graco, �Domain-Driven, Actionable Knowledge Discovery,� IEEE Intelligent Systems, vol. 22, no. 4, pp. 78-88, July/Aug. 2007. L. Cao, Y. Zhao, H. Zhang, D. Luo, C. Zhang, and E.K. Park,�Flexible Frameworks for Actionable Knowledge Discovery,�IEEE Trans. Knowledge and Data Eng., vol. 22, no. 9, pp. 1299-1312, Sept. 2009. XiaohuiYu , Jimmy Xiangji Huang ,�Mining Online Reviews for Predicting Sales Performance: A Case Study in the Movie Domain� IEEE Trans. Knowledge and Data Eng.,Vol. 24, No. 4, April 2012. R. Mikut, M. Reischl, �Data Mining Tools,� Wiley Interdisciplinary Reviews: Data Mining and Knowledge Discovery, vol.1, no. 5, pp. 431-443, 2011. A. Faro, D. Giordano, F. Maiorana, �Mining Massive Datasets by an Unsupervised Parallel Clustering on a GRID: Novel Algorithms and Case Study,� Future Generation Computer Systems, vol. 27, no. 6, pp. 711-724, 2011. F. Maiorana, G. Fazio, �Knowledge Discovery from Text on a Cloud Architecture and its Application to Bioinformatics,� in Proc. 9th International Conference on Biomedical Engineering, IASTED , 2012.